The Behringer GDI21 | WhatsTheScene? 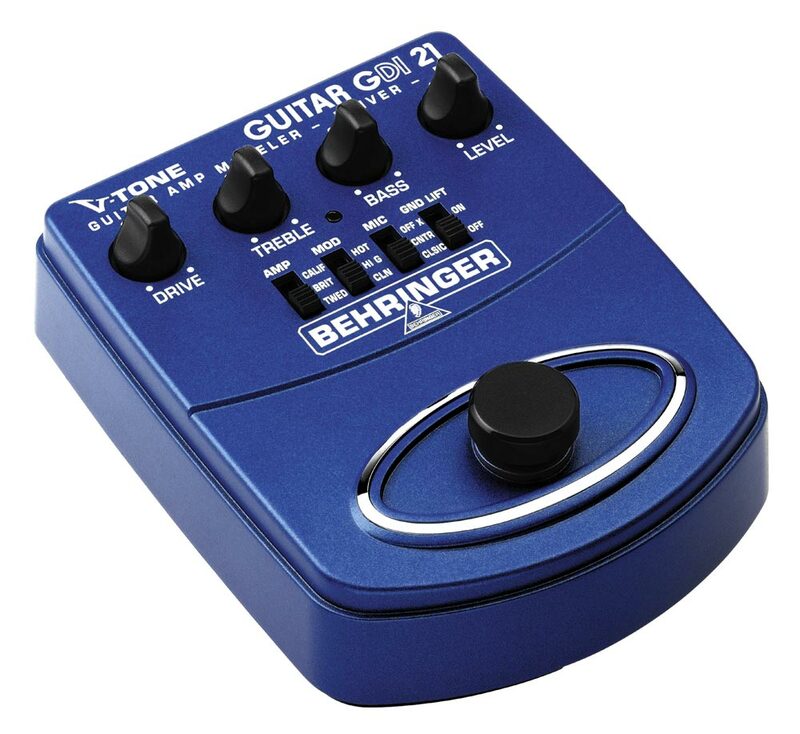 The Behringer GDI21 is one of the first ever pedals I bought when I decided to shift from multi-effect processors to boutique, effect-dedicated guitar pedals. To start off, the GDI21, like a host of other Behringer pedals, is a clone. It’s a cheaper knock-off of the Sansamp GT-2, and like the GT-2, it’s a guitar amp modeller. But it does so much more. It also acts as a direct recording pre-amp and DI box. The first thing you’d notice about the pedal is the relatively large number of knobs and switches. The pedal recreates three different guitar amps, with three gain modes and three mic placements, giving you a total of 27 possible configurations. The three amps that are recreated are the Mesa Boogie(Calif), Marshall(Brit) and Fender (Tweed). Each of these amps can be set at three different modes: Clean, Hi-Gain and Hot. If you’re still not satisfied, you may even select how the “amp” should be “mic-ed”. There’s a simulation of where the mic is placed with respect to the cabinet cone. You can choose between ‘off-axis’, ‘center’ or ‘classic’. There’s also a ground-lift switch, which helps in reducing noise. You may also configure your tone via the four knobs present on the pedal: Drive, Bass, Treble and Level. The pedal is extremely versatile. It gives you a good tone for almost any genre of music, from jazz to metal. The Mesa Boogie simulation has the beef to pump out some heavy gain, well-suited for thrash/speed metal. The Marshall simulation is perfect for some crunchy rock ‘n roll. I was successfully able to extract a close-to-authentic AC/DC tone (just for kicks). The Fender amp that’s simulated is the tweed. This is probably the best tone the pedal provides. The warm clean tone is reminiscent of an Ibanez Tube-Screamer. I set the pedal to ‘Brit’, at ‘Hi-Gain’ with the mic at ‘classic’ and ground-lift on. Keeping the drive at 10 o’clock, treble at 1 o’clock, bass at 11 o’clock with my Epiphone Les Paul Standard. With the Yamaha Pacifica, I use the ‘Brit’ for overdrive, with drive at 10 o’clock, treble at 11 o’ clock and bass at 1 o’clock.The pedal goes either into the amp or to my Zoom G7.1ut processor, which provides rudimentary cabinet simulation going out to my headphones. The pedal provides a “true bypass”, which makes for a pure clean tone, or however your native tone to the amp is set. The pedal, set to my needs, gives me a warm crunch that drives hard for the most part and cuts back to a driven clean when I cut the volume from my guitar, giving me a teasing tone that plays out like a clean tone that’s itching to unleash itself. The pedal sounds more dynamic by setting the drive low and having the mod switched to hi-gain, as opposed to turning the drive up and having the mod switch at clean. They both achieve the same amount of gain, but the former has a beefier and more dynamic feel. With all this tonal goodness, come two major drawbacks. Firstly, the body is not metal, but reinforced plastic. Now that can be a rather scary deal considering this is something you’re going to be stomping on when you’re playing live. Having said that, I’ve had this pedal for three years. Over the course of roughly 25 gigs, and playing daily at home, the pedal has not worn out in any form. The second drawback is not a major one, but would definitely help in terms of tone. The EQ controls should’ve included a knob for mids. That one extra knob would make all the difference in tone and make it a truly great pedal. But you can make up for that with a dedicated EQ pedal or tweaking the EQ on the amp. All in all, the Sansamp GT-2 is a heavenly pedal. Head-to-head, it outclasses the GDA21 in every aspect, be it the metal casing, or the subtle dynamics that propel your tone to a whole new level. There probably isn’t any reason you should pick the GDI21 over the GT-2, except the gigantic price difference. You can pick up a GT-2 for roughly USD450. The GDI21 is available for about 30 USD. That’s almost 15 times lesser the price of the GT-2. The sacrifice in tone dynamics hardly compares to the money you save, leaving you room to add more to your rig.